In the information visualization world, treemaps are on the rise…and justifiably so. Treemaps simultaneously show the big picture, comparisons of related items, and allow easy navigation to the details. However, treemaps aren’t easy to get right. In contrast to basic charts where Stephen Few, Edward Tufte, and the Chart Chooser have laid down the law, treemaps roam the Wild West of interface design, obeying few rules, breaking many, and contributing to much infovis lawlessness. Over the last year or so we’ve been building treemaps for our clients using our (recently open-sourced) Flex-based JuiceKit™ SDK. Over the course of these projects, we’ve thought a lot about the best way to make treemaps easy to understand and use. I won’t claim we have “cracked the code,” but we have gotten a feel for what works and what doesn’t. I want to share some examples of the good and the bad in treemap design, and hopefully gather some feedback so we can continue to evolve our thinking. Size of the boxes should be a quantity measure. The measures should sum up along the hierarchical structure of the data. The sum of all the elements in one branch need to sum to the value of the branch as a whole. Therefore, you can’t use ratios or dates or any other measure you wouldn’t use in a pie chart. Color of the boxes is best suited to a measure of performance or change such as growth over time, average conversion rate, or customer satisfaction. The King of Treemaps — Smart Money’s Map of the Market — offers a classic set of measures: size represents market cap; color represents change in market cap. Like a pie chart, size represents value in a treemap. In the following example from LabEscape, the category labels use space -- almost as if you added slices to a pie chart for labeling. This approach distorts the values by arbitrarily using space, making it harder for the viewer to visually compare sizes. Labels are hard to get right in a treemap. 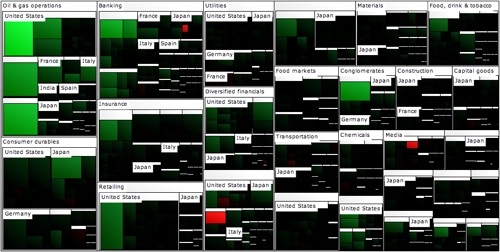 If you aren’t careful, labels can clutter up the treemap without adding useful information. 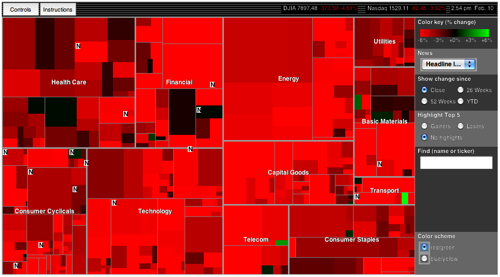 This Macrofocus treemap wasn’t careful. Notice how the majority of labels get reduced to just a few letters or simply an ellipses (“…”). It would be better to show nothing until the user rolls over a box. 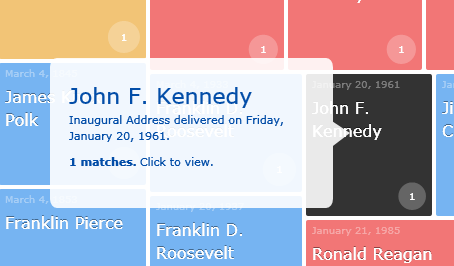 One of the unique challenges of a treemap is that the labels need to stand out against a multicolored background. The ILOG Elixir treemap chooses to put the labels in a white text box. Unfortunately these text boxes look clunky, obscure some of the data, and don’t always fit into the allotted space. To neutralize the contrast of the label to the background and ensure legibility, we created a “glow” around the text. The New York Times folks know what they are doing when it comes to visualizations and the explanations around them. Below is the legend for a treemap about automobile sales. The meaning of size and color aspects are articulated in a small space. The nature of your color measure should determine whether you need a one-sided or two-sided color range. In situations where the color measure has both negative and positive values (e.g. period over period growth), we typically use a two-sided color range with a light grey at the middle. A one-sided color range is a better fit when the measure starts at zero. 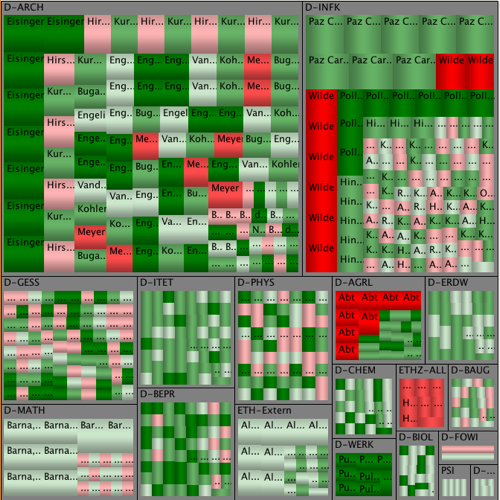 The Hive Group treemap below offers an example where a two-sided color range (red to green) doesn’t make as much sense. This treemap is using color to show geographic area rank from 1 (largest) to 195 (smallest). One of the nice advanced features treemaps can offer is highlighting items that meet a user-specified criteria. 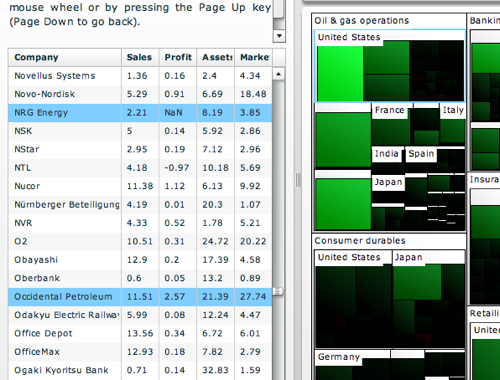 In the Many Eyes treemap below, a search features identifies that companies that include the selected search term. Not only does this aid the navigational capabilities of the treemap, it allow allows you to see color, size, and location correlations for the selected items. When you want to show variations in the data (e.g. changing time periods, filtering, changing measures), we’ve found that animation effects can help emphasize the differences. 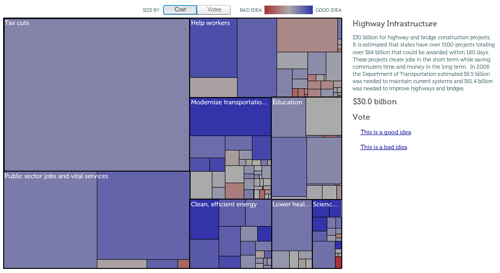 In our stimulus plan treemap, flipping between “cost” and “votes” to size the boxes results in an animated reorganization of the boxes. The boxes that get bigger move to the upper left and those that shrink move down and to the right. The effect helps the user track where things are moving and get an understanding of the overall differences in the treemap. When a user selects a node in a treemap, they should see the available detail either in a tooltip window or in the sidebar. If the detail is substantial in size, it is best to push it into a sidebar as we did with our Stimulus Plan Explorer. Simpler data can show up in a tooltip box like the beautifully designed tooltip created by MIX Online (notice how it flips around to stay within the borders of the treemap). ILOG Elixir’s demo recognizes the need to see detail, but the execution is flawed. 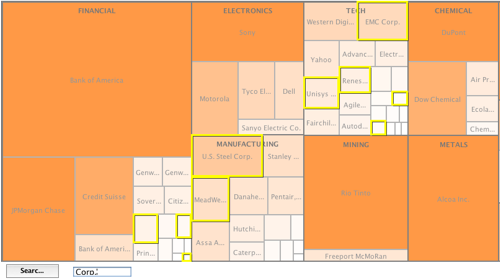 Selecting a box in their treemap highlights rows in a table, but the rows are not consolidated so you are lucky to see only one or two rows of highlighted data. Users need to scroll through a massive table to be able to see the complete details. 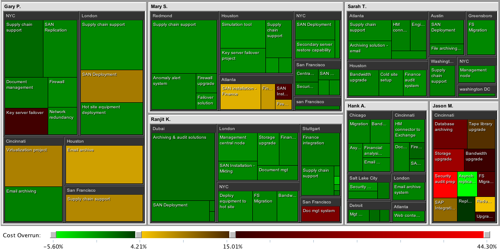 Panopticon has a powerful treemap offering, but their demo treemap has some missteps in showing the detail. In particular, they choose to show as much detail as possible, but in a faint grey text. When you roll-over a box, this text becomes legible just as a redundant pop-up box appears. Detail is shown before the user has even expressed any interest in the box. Better to wait until the user rolls over or clicks on a box, then show the details. In the meantime, let the size and color do the talking. These are just a few of the design lessons we’ve considered in our work. Treemaps offer an opportunity to make vast and complex data accessible — but they depend on thoughtful, user-friendly design. How about you? What are some of the design features you have seen in treemaps that you think are particularly effective in making the communication of information stronger?